Kickstarter Alert: 'On the Trail of … Bigfoot' with Seth Breedlove and Small Town Monsters – AiPT! Tim Disney Interview: "I'm an obsessive reader nerd type"
Recounting stories of the strange. This may come as a shock, but we here at AiPT! Science have a huge love for monsters. We’ve explored famous movie monsters, mythological beasts, nightmarish entities from video games and comics, even fiends from outer space, however there’s one group of monsters that grabs our attention regularly: Cryptids. Monsters like Bigfoot, Mothman, and El Chupacabra are exhausting but so much fun to talk about and imagine the “What-if’s.” Those fascinating creatures somehow elude evidence and drive us mad, yet they tend to capture our hearts like no others. Today we have have a super special exclusive interview with someone else who loves cryptids even more than we do. Seth Breedlove is the founder of an independent film company called Small Town Monsters (STM), who make documentaries based on local legend and lore from an objective point of view. The films are fun and intriguing, well done in both cinematography and story. Their brand new Kickstarter seeks to gather support for three new documentary films: On the Trail of … Bigfoot, Terror in the Skies, and Momo: The Missouri Monster. The campaign is live now, and they’re hosting a monster of a launch party on their Facebook and Instagram accounts for some awesome perks, peeks, and prizes! AiPT! : First thing’s first, let’s get a little bit of background. 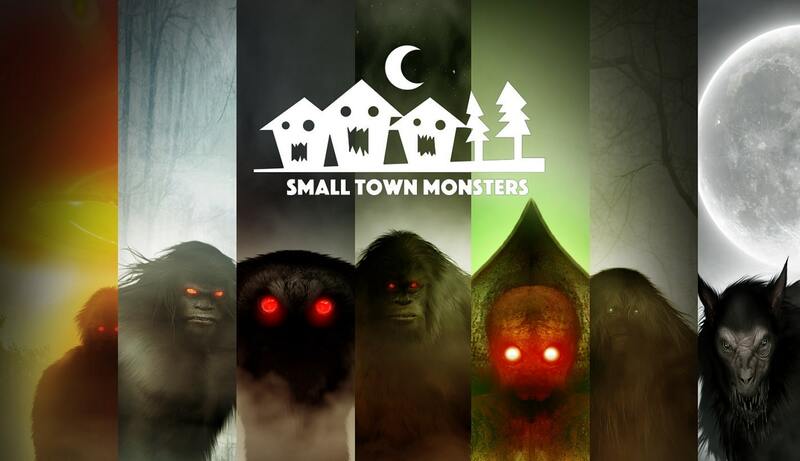 Would you mind introducing your crew and telling us how Small Town Monsters got started? Breedlove: STM began life as a book proposal that I wrote back in late 2013. It was a written collection of cases and sort of a guidebook to America’s hometown monsters. Unfortunately (or, I guess fortunately) it was rejected by every publisher I sent it to. A couple months later I was talking to some guys I knew who owned a bunch of camera gear and I offhandedly mentioned thinking that one of the cases in that book proposal would make a good movie. We ended up creating the movie, Minerva Monster, ourselves, and it became the first in our series. The actual crew tends to be myself writing and directing, my wife Adrienne producing, my friend Zac Palmisano as director of photography, and another good friend of mine, Jason Utes, handling sound and random production manager duties. Typically we have two or three others with us on any given shoot, although I’m just coming off doing an entire six episode mini-series completely on my own. AiPT! : You have full-length documentary films, but you also do mini-series and case files. Tell us a bit about what to expect from them and where we can find them if we want to check them out. Breedlove: Well, the films are very cinematic and tend to be heavy on mood, creature FX, animated sequences, and illustrations. We like to approach those like we would approach making a traditional narrative feature and try to completely envelop the viewer in that story we’re telling. On the Trail of… is our foray into episodic storytelling and it’s much more traditional documentary-style or even news-shooter style with a heavy focus on investigation and the scenery where the stories we’re telling are set rather than focusing on recreations or animation. CaseFiles is a web series that I create in my spare time where I can basically doll out some of the really cool, cut footage or pieces of the cases we cover that get left out. Episodes usually clock in under 10 minutes and are supposed to be taken as an addendum to the films they’re an off-shoot of; like the Indrid Cold episode which focuses entirely on the Indrid Cold case that only gets about a minute of screen time during The Mothman of Point Pleasant. AiPT! : Many people live in areas that have some sort of tale of a cryptid creature, but what initially inspired you guys to want to research further into the myths? Did you grow up in an area with these sorts of legends, or was it something that developed later on? Breedlove: I think every town or geographical region has their own fair share of legends and lore; many of them revolving around a local monster. Where I grew up it was actually the Minerva Monster, but I became really aware of that case and what it entailed much later in life. What made me want to dive deeper into local monster stories were all these reports that came out of some of the rural areas near where I grew up of Bigfoot sightings and mutilated animals that were found following the sightings. It’s like a rabbit hole, because you get into it for very obvious reasons, but then you start to slide deeper and before you know it you’re making a career out of investigating strange occurrences. AiPT! : Your documentaries cover various types of cryptids from all across the country. How do you go about finding the ones that you want to cover? Is there a process you go about for examining the history behind them? Breedlove: We are still working our way through the list of monsters that I’d written down back in 2013 when I put together the book proposal. Occasionally we dive into a story like Invasion on Chestnut Ridge that we just find interesting, that wasn’t part of that initial list, but for the most part these are all cases that I’ve been aware of for a long time and couldn’t wait to explore for myself. I tend to focus much more heavily on the human element of the story rather than the monster itself. The monsters are cool but what I like to know is how the sightings or encounters affected the lives of people who claimed to have witnessed the creature. AiPT! : It’s clear that there is an element of skepticism to what you do and that you base your tales on documented accounts and factual evidence. When investigating witness claims and evidence, how do you weed out the bull from the credible? Is finding factual evidence or claims more difficult when dealing with cryptids, due to the vast lengths of time since some accounts have taken place? Breedlove: I wrote for newspapers for a few years prior to this, so I think I have an eye for weeding out the truth. But, the fact is, there’s never any way to know for sure. Hopefully, these people are being honest with us and in most cases I don’t believe the people we’re interviewing are lying. There’s really very little to gain from lying to people about seeing something unexplained. Coming forward with a sighting tends to paint a bullseye on people and make them an object of ridicule more than positioning them to make money or earn some fame. We actually don’t spend a ton of time on evidence gathering, as our job is to let people tell their stories in their own words. We do try to corroborate accounts when possible. The hardest part of this tends to be convincing witnesses to even be involved in what we’re doing to begin with. Due to passage of time and a lack of interest in being on-camera, I spend a lot of my time building relationships with witnesses just to convince them to tell us their story. Understandably, many people are reticent to attach their face to a story about seeing something most people consider ridiculous. AiPT! : In a Facebook Live chat recently, you mentioned that people seemingly want to merge cryptozoology and the paranormal. Can you expand a little on that? Breedlove: Sure, I believe the discussion was centered around how some people want to ascribe supernatural or paranormal origins to a creature like Bigfoot. For the most part, accounts of Bigfoot seem to indicate some sort of unknown primate. It starts to muddy the waters some when you start ascribing supernatural or paranormal beliefs to the sightings and can turn the scientific community off to the entire notion of Bigfoot to begin with. This isn’t to say there aren’t sightings of Bigfoot that involve UFOs or portals or whatever, but they’re very few and far between. A tiny percentage of Bigfoot reports involve things that are even weirder than an 8-foot tall undiscovered ape. AiPT! : You know I have to ask — those popular TV shows like Finding Bigfoot and Expedition Unknown — how do you feel about them? They ran episodes for what seemed like forever and never found conclusive evidence. A lot of people were quick to call bunk on them when they hung up their gear last year. Breedlove: You picked out two of the ones I actually like! I enjoyed Finding Bigfoot for what it was, and [I] think Josh Gates seems like the nicest dude on earth. BUT, I’m completely fed up with watching people troop through the woods looking for the unexplained and trying to find evidence of it. Low budget or big budget, filmmakers have got to stop trying to do their own version of that tired, old shtick. There are plenty of other ways to tell stories about the paranormal without sticking a camera in someones face and following them through the dark for an hour. AiPT! : Here is a two part question. You guys have done a lot of work that is based around ape-like, woodland, Bigfoot-type creatures. 1) What do you think — are they likely to exist? and 2) If you do believe that some of the creatures exist, aside from inviting them to watch your films, what would you like to say to the naysayers? Breedlove: I had an experience in the Ouachita Mountains in Oklahoma this past summer that has swayed me toward the opinion that Bigfoot might possibly exist. The entire event is documented in On the Trail of … Bigfoot. I was soooo skeptical last year that I was around 30 percent that there could be anything to the entire phenomenon and now I’m closer to 80 percent that they’re out there. I actually make my movies as much for skeptics as believers. That’s one of the reasons we don’t mess with evidence gathering or trying to sway viewers one way or the other. Our tactic is simply to tell the story and step back to let the audience decide for themselves. AiPT! : Even though you try to approach things from a skeptical point of view, you’ve surely had experiences where other skeptics and hardline non-believers call you out or dismiss you for your work. What do you say to them? Breedlove: Oh, we get dismissed by people on all sides. Believers occasionally get annoyed that we don’t do more to explore evidence, and skeptics get irritated that we don’t do more to debunk the cases we cover. I don’t really mind either way; my job is to be an objective documentarian, catalog the stories we’re told, and tell the story in a way that hopefully doesn’t bore the audience. My most frequent reaction to people who complain about our way of telling stories is to go watch other documentaries about non-paranormal subjects and then come back to ours. We’re making our documentaries in the most objective way we can under the budget and time constraints we’re under. AiPT! : Tell us about the new Kickstarter! There are three different movies coming into play here, On the Trail of … Bigfoot, Terror in the Skies, and MOMO: The Missouri Monster. What can we expect with these films? Breedlove: On the Trail of … Bigfoot is a six episode mini-series that takes viewers through the entire history of the Bigfoot subject from the 1800s to present day. It was shot on location in 14 different states, features over 20 interviews, and will guide viewers into some of the densest forests in North America … with my ugly mug leading the way. Terror in the Skies is a feature-length documentary that focuses on the winged cryptid phenomenon in Illinois. It starts in Southern Illinois and takes viewers through the Piasa Bird Legends, and ends in Northern Illinois with the ongoing Chicago Mothman series of sightings. There are all sorts of surprises in between, and I think it’s by far the most gorgeous movie we’ve ever shot. Momo: The Missouri Monster is what happens when you mash up 1970s horror cinema with our traditional documentary work. It’s going to be unlike anything we’ve ever done before and I’m super excited to get to work on that one. I’m currently finishing up the script for it and it’s so much fun. The first trailers will blow some minds. AiPT! : Are there stretch goals or cool Kickstarter perks? Breedlove: Tons of cool stuff. A Momo t-shirt designed by Sam Shearon (who did the poster) a Mothman decal, DVD copies of the films, a Small Town Monsters hat … we even have a MOMO statue. Oh, and you can get your name in the credits of all three projects. Plus, a ton of stuff I’m forgetting. AiPT! : You guys have some really interesting stuff coming up after MOMO ends. Can you give us a bit more about your Southern endeavors? And you dropped the possibility of UFO stories? Breedlove: Yeah, late this year we’ll begin work on The Mothman Legacy which is a direct sequel to our movie, The Mothman of Point Pleasant, as well as a feature-length documentary on the Bell Witch in Tennessee. We really are hoping that On the Trail of … Bigfoot does well so we can jump into making On the Trail of … UFOs, which would be another episodic mini-series that takes viewers through the history of the UFO subject. AiPT! : Thanks Seth, I appreciate your time. We look forward to seeing what all the future holds for you and Small Town Monsters! Breedlove: Thanks again for this and for your support in general. There’s so many strange things just in our own backyards. We’re glad that we can be a small part in sharing those stories. Check out the new Kickstarter, and you can watch the previous documentaries on Amazon (yes- they are on Prime!) and YouTube, and be sure to see their website for more information on the crew and production, upcoming events, and some really sweet merch! Every February, to help celebrate Darwin Day, the Science section of AiPT! Comics cranks up the critical thinking for SKEPTICISM MONTH! Skepticism is an approach to evaluating claims that emphasizes evidence and applies the tools of science. All month we’ll be highlighting skepticism in pop culture and skepticism of pop culture.